Army photograph by Sgt. Jose A. Torres Jr.
Lt. Gen. Michael D. Lundy, commanding general, Combined Arms Center, Fort Leavenworth, Kansas, speaks to audience members attending the Association of the United States Army Institute of Land Warfare Hot Topic: Army Air & Missile Defense, A Professional Development Forum, held at the AUSA Conference and Event Center in Arlington, Va., Feb. 7, 2017. The future of networked mission command faces a number of challenges, chief among them being a current reliance on a variety of different networks — all with their own specialties, systems, and communications methods. 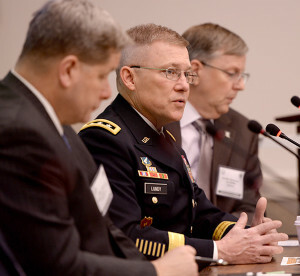 That was the consensus at the Association of the United States Army’s Air and Missile Defense “Hot Topics” forum discussion panel at Arlington, Virginia, Tuesday. Networked mission command in the future should rely on an entirely seamless network that allows for all forces to communicate quickly and easily, across the multi-domain battlefield, said Lt. Gen. Michael D. Lundy, who spoke as part of the forum. Such a seamless network would empower subordinates to exercise “disciplined initiative in the absence of further orders,” he said. A single framework is needed to pull together both the organizational and functional networks, said Jefferey Witsken, the director for Mission Command Network Integration at the Mission Command Center of Excellence, Fort Leavenworth. Standardized equipment would also decrease the required training hours associated with each system, he said. The operational requirements of the networked mission command of the future must first be identified; then those requirements will drive the technical requirements, Lundy said. Ultimately, Lundy said that tactics and training will be the keys to mission command’s success. He added that combined arms field training should emulate the warfighting efforts and involve multi-domain operations that account for the information environment and electromagnetic spectrum. As the Army continues to develop a single framework, another growing concern is the Army’s ability to augment and extend the network. According to Lundy, the current capabilities of the network are limited to line-of-sight or satellite communications. The Army’s ability to improve the network’s survivability will determine the future of networked mission command, Lundy said. The network’s survivability hinges on the Army quickly incorporating the Defense Department’s network. The Defense Department’s network is a primary enabler to mission command, McGee said. “This is something the commander needs to understand intimately and start giving priorities to aggressively maintain and defend the network, especially in an area where it can become contested,” he explained. On the other hand, augmenting the network has become increasingly difficult, as commercial sensor technology becomes more readily available to potential enemies, such as non-state actors, who might use them to disrupt communications, according to Steve Cook, with the Air and Missile Product Line at Northrop Grumman. 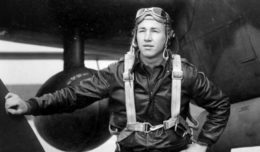 In the end, training and leadership development will play a huge role in the successful implementation of the networked mission command, according to Lundy. “Do you build the network from the Soldier back, or do you build it down to the Soldier?” Lundy asked.